I see a lot of chemistry on this forum and talk of what so and so should be. Is there a set rule on certain chemical concentrations or conditions that should absolutely be avoided and not swam in? ph 8.0 maybe a touch above that. 1. broadcast 1lb alk around pool, wait 2 hours. They also sold me one of those floaty deals that hold the chlorine tabs and a small bucket of tabs. No instructions about that were given so I just broke a tab in half and stuck it in. So, with my before and after tests and the recommendations given by the pool store, is there anything else I should do, not do, test? My MAIN CONCERN is hurting my 22 month old son tomorrow when we get back in the pool. Which brings me to another question, how long should I wait to get in, the pool store lady was vague. You will probably find it helpful to read the following link. It will really help you to manage your Intex. From your numbers, I see nothing at all that would make it unsafe for you or your son to get in the pool. What makes things unsafe is when there is not enough chlorine in the pool to kill germs and things. You have added enough stabilizer to get you almost to 40 ppm which is ideal. Stabilizer (CYA) helps keep you from losing all of your chlorine to the sunlight. With 40 of CYA in there, your free chlorine (FC) should never fall below 3. 5 is perfect. 8, which you have, is also fine. Your pH is a little high at 8.0. This is not dangerous but high or low pH levels can cause eyes to be irritated. You lower your pH with acid, either muriatic acid or with pH down powder. Keep pH between 7.2 and 7.8. You don't need anything to adjust hardness. I wouldn't use any tablets for chlorination. They add CYA and you should already have enough in there dissolving to get you to about 40. I would use plain, unscented bleach. It's the same thing, easier to measure, cheaper, and doesn't add anything that you don't want in there. There's probably too many to list. The big ones are pH out of the comfort zone and too much or too little Chlorine. You can also run into problems if CYA (stabilizer) gets too high. You'll show high chlorine, but not enough of it will be available to kill bacteria and algae. You can also end up with copper problems, which will turn hair green, but probably isn't toxic. You need your own test kit. Pool maintenance is pretty easy if you're not driving blind. You won't need all those buckets o'chemicals once you read Pool School. So from one newbie to another... WELCOME TO TFP! I will give you the low down. I wouldnt go by anything they say! When I got my pool up and running and went to my pool store to get stabilizer they tried to force me to go their route. First off I would drain the pool, rinse it and then refill. All you need is bleach, borax,baking soda and muriatic acid. The first 3 you definitely need. Bleach is your sanitizer. Its the same as chlorine. Borax is used to raise pH. Baking soda is used to raise Total Alkalinity. Muriatic Acid is used to lower pH. Instructions on how to use this stuff is later. Next you WILL need a better test. Get the TF100 at http://www.tftestkits.net/ Its worth it. It will save you a huge head ache in the long run. It will make things so much easier to manage. 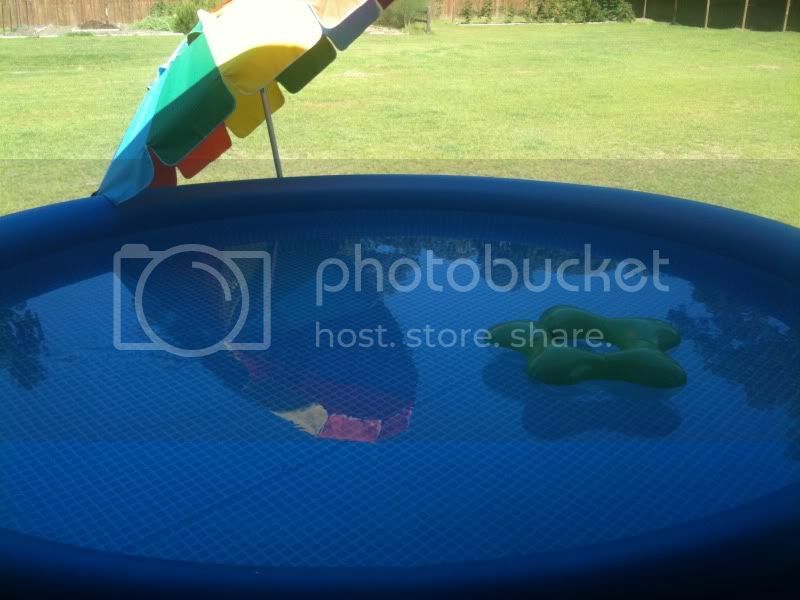 Now how to use those everyday cheap household chemicals to keep your pool in balance. READ POOL SCHOOL! pool-school/ And the pool calculator http://www.poolcalculator.com/ When you get your kit, check your levels with the kit. Plug in all the numbers into the calculator and it will tell you how much of each (either weight or volume) to add to your pool to get the desired levels you want. It will even tell you the levels you SHOULD have your pool at! I would drain the pool and rinse it and let it sit in the sun till you get your kit or you might have something nasty growing in your water before you can accurately test the pool. Strips really dont do a good job. Too bad you didnt find this site before you bought all that uneeded chemicals. I am glad I fount this site before I did. But that is why I bought my salt water system too. But I didnt really need it. Oh well, at least I will have it when I upgrade! Thanks for the replies guys, that was quick. I've been reading pool school, my eyes are bleeding..haha. I've gotta go to bed to refresh. atcnick, your numbers are mostly reasonable, as Mag pointed out. The pH is a bit high, that's about it. I'll get to chlorine in a bit. Regarding safety chemistry-wise, with all due respect to Richard320 it is primarily chlorine and pH that matter. Other things being out of whack can cause other kinds of trouble, but they are mostly annoying rather than a safety concern. For keeping pH and chlorine in line, I'd suggest a simple "2-way" pH/Chlorine test kit that uses drops, as being much more reliable than the strips. I admit the strips do (try to) test more things, but they generally don't do a great job. The tablets might or might not work for you. The main ingredient is probably sodium trichloro-s-triazinetrione, yes? This is a triple-threat chemical: adds chlorine, adds stablizer, decreases pH. There are times that might be what you want, and if you hadn't already added stabilizer, this would have been one of those times. These are the 3" hockey pucks, it sounds like. As it stands, you could continue using the tabs, but after about 2 full tabs your stabilizer will be too high to measure and you'd need to dump and refill the pool. (In an over-stabilized pool, normal chlorine levels really become ineffective.) So, I would recommend bleach rather than the tabs. In your pool, 1 cup regular unscented household bleach is worth about 2ppm chlorine, and until you get your own test kit, adding 1 cup each evening with the pump running should keep everything clean and sanitary. For lowering pH in a very small pool like yours I would suggest dry acid (often sold as "pH Down") rather than muriatic, and according to the Pool Calculator it looks like a less-than-full 1/4 cup would be about right to bring it down to around 7.5. You had one other question, how long to wait after adding stuff. In a small pool, I would suggest waiting 15 minutes after you add anything, before you either add the next chemical or hop in the pool. (And always have the pump on when you add chems.) The exceptions would be the slow-dissolving stuff like stabilizer and the tabs, they can just sit there without bothering anybody. Post back with any more questions, or just to say how things are going! From one newbie to another, welcome. This site is a life saver. You will find the BBB method so simple and easy once you start to understand it that you will start enjoying testing your pool. The great thing for me about this method is that you can micro manage your chemicals and have confindence that you are not exposing the swimmers to unwanted visitors to your pool. With the mass market CL tabs you really have no idea how much cl or cya your really adding to your pool, I don't like not knowing. Like many have stated get a good test kit, even though you have a small pool it still requires proper testing and mgmt. 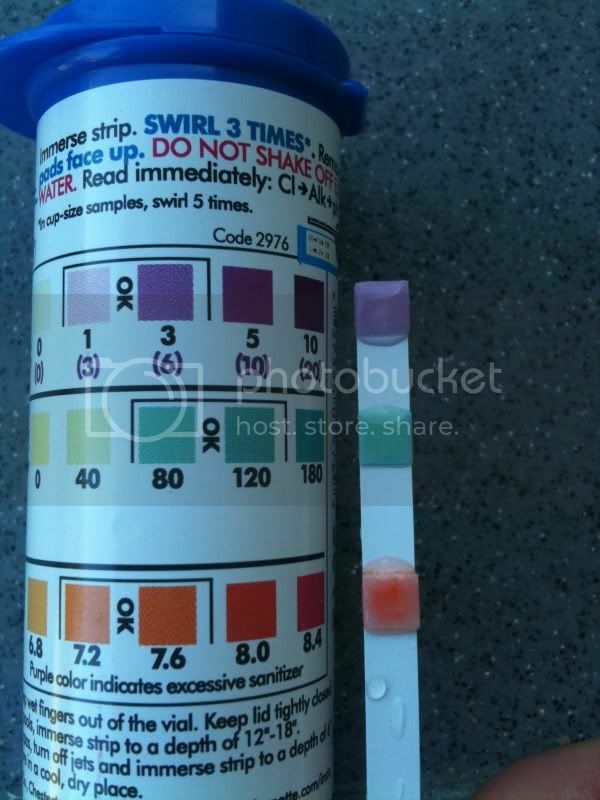 Alrighty, I tested the water this morning (about 12 hours after adding the chemicals) and looks like the free chlorine went down, alkalinity about the same, and pH went down. I didnt add anything that specifically targets pH. 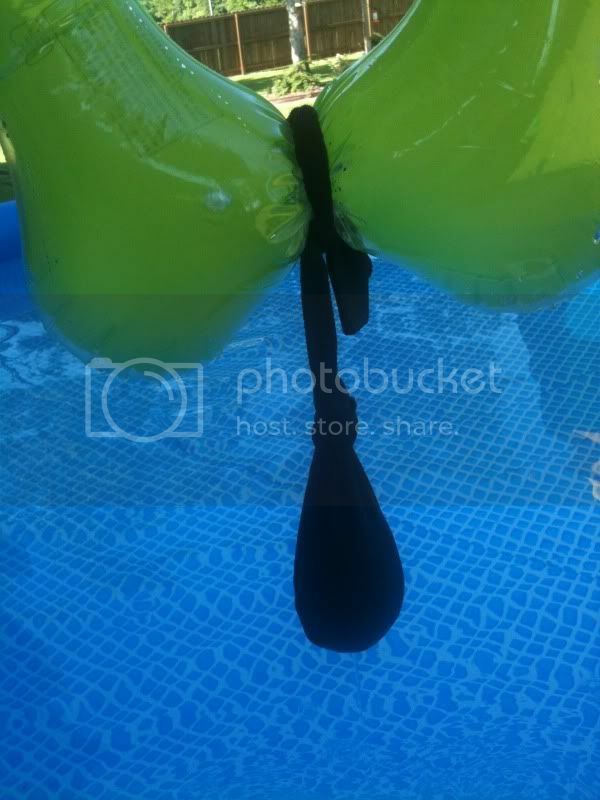 First pic below is the pool, second is the 9oz of stabalizer in an old sock tied to a floaty!, third is the little float thing that holds chlorine tabs with half a tab in it. Pool School says to add stabalizer over 4 day period in several doses. The pool store I bought the chems from told me to just add it to the sock like so. Any problems with that? I'm going to head out this morning and buy a real test kit as the strips are not accurate, according to pool school. Thanks for the help guys. Thanks britmandogs, yes, this is a VALUABLE resource, Im suprised its free! Nick...welcome. Do yourself a favor and order the TF50 or TF100 from TFtetskits.net...most pool stores do not have a kit that can measure FC, CC, TA, PH, CH and CYA....the only store that may have it is Leslie's (rebranded Taylor K20060...but even there it is usually only on their website. Tfteskits.net owner (Dave Smith) happens to own TFP...the test kits we believe are more economical and profits support this wonderful resource. Also, should you become a supporting member, I believe you would be eligable for a $10 discount on the TF100 if you become a lifetime contributor of TFP. The main ingredient is probably sodium trichloro-s-triazinetrione, yes? This is a triple-threat chemical: adds chlorine, adds stablizer, decreases pH. It does say trichloro-s-triazinetrione, doesnt say sodium, but I assume its the same. That would explain a slight drop in pH from last night to this morning. Thanks for the info, I'll remove the chlorine tabs and pick up some chlorox at Walmart. I have an Intex and so far I've liked having the smaller kit from TFtestkits.net that is just the FAS-DPD kit. Then I have a $5.00 HTH kit with an OTO test for total chlorine and does pH (I never use the OTO, but do check pH occassionally, which has always been between 7.2 and 7.8 and usually spot on 7.5). Lastly, I have a CYA test from TFtestkits. Not sure if I get off cheaper doing it this way, but whatever I pay it seems reasonable and provides me with all the info I need for my small seasonal pool. I just can't get comfortable with anything other than the FAS-DPD means of testing for FC and CC, which I do nightly. Takes about 10 minutes start to finish to test, add bleach, and re-store the chemicals and testing equipment. Every few days I check pH, but it stays pretty constant for me so far. Maybe I'm lucky with my fill water, but all I've ever had to add is CYA and bleach. I'm not trying to talk anyone out of the bigger kits, I'm just saying I've been comfortable with the smaller kits for my situation. Last year I used dichlor to add the CYA, but I don't like that I had to wait so long to finally determine my CYA level via a test (took 2 weeks to add it, then wait a week to test it). I also thought doing it in small doses of dichlor took longer to add each day (measuring it, dissolving it, etc), and was messier than adding bleach, with more room for error in terms of spilling granuals around small kids. So this year I switched to buying a pound of stabilizer at the pool store and could thus add it all at once instead of incremenatlly like the dichlor. For me, the all at once method is much preferred (note, you should aim low the first time, wait a week, test, and add more if needed -- you don't want to get too high by mis-dosing the first time, especially since the capacity of these little pools is pretty variable based on how level the ground is and how perfectly the pool kept its shape when filling). Both methods of adding CYA get you to the same place if done correctly, so it is really a matter of preference. Good luck with your pool, don't hesitate to ask questions here, and before long you'll feel in total control and love spending a little time each night to ensure the following day you'll have sparkly, inviting water if the weather and schedules align for a swim party! 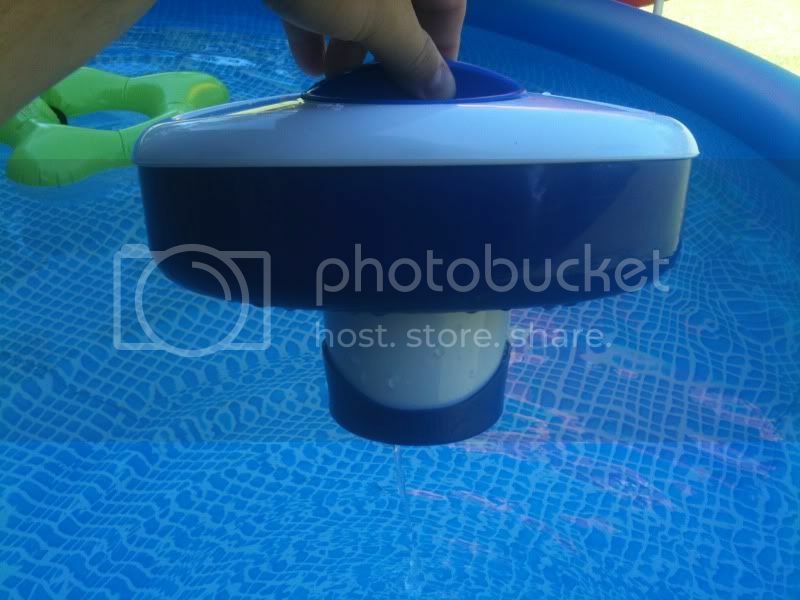 If it were my small seasonal pool, I would remove whats left of the stabilizer in the sock, then use the pucks for the summer which will slowly add CYA. Given the high pH in the original fill water I suspect acid in the tri-chlor will not be an issue, any topping off should counter act anything the tri-chlor does.. If Trichlor pucks are used, then the Total Alkalinity (TA) level can be kept much higher which will not only buffer the pH more, but will tend to offset some of the acidity since the higher TA outgasses more carbon dioxide. In fact, with a high enough TA level and enough aeration, one can have fairly stable pH, though the TA will drop over time. Let's say that the TA is at 150 ppm (this presumes that the fill water isn't very high in Calcium Hardness). At 2 ppm FC per day chlorine usage, the pH would drop from 7.5 to around 7.1 if there were no outgassing and the TA would drop by around 10 ppm and the CYA would rise by 8.5 ppm. With outgassing, the pH probably drops to 7.3 or so. Basically, you can usually go a week using Trichlor without worrying about the pH, but you can't go much longer than that -- two weeks of Trichlor (with no outgassing) has the pH drop to 6.9 -- not a disaster, but better to not get that low.